Last year a small scouting party attended EGX 2014, held at Earls Court London. Much queuing was participated in by all accounts, and apart from a guest appearance on an Xbox advert, the overall experience was a bit of a let-down. So with EGX now moving north to the NEC in Birmingham it was up to KP (the only remaining attendee from Team Queuing) and I to see what was on offer. The venue itself was fantastic, with 4 times the floor space of EGX 2014. With our early access tickets we were queuing from around 9am until doors opened at 10am, but were sufficiently entertained by a video on the big screen explaining what was instore for the day and showing games that would be on the show floor. The crowd were certainly eclectic, with a wide cross section of people including a 300lb bearded gentleman dressed as Princess Peach (yes there was Cosplay) to teenagers running to play Fifa 2016 despite its release 3 days prior to the show opening! Game two on our hit list was Star Wars Battlefront, but this was a non-starter from the beginning. The queue never dipped below three hours so we had to be content with screen watching and admiring the massive tiefighter built in the middle of the arena. It was at this point that we discovered the extensive retro games area. From pong to pinball, it was there. Machines playing Outrun, all the Mario titles and 4 player split-screen Goldeneye like the good ol’ days. The best discovery of all was Blur, a much underrated (and under advertised) racing game released in 2010 by Bizarre Creations. A cross between Project Gotham Racing and Mario Kart, the gameplay still feels fantastic with tight handling and interesting track design. We really should have been playing new games, but the joy of finding this was too much to pass on and many nostalgic races were had. I will definitely be spamming the Microsoft forums to get this up the list for backwards compatibility on Xbox One. Next up was a trip back to the Microsoft booth for a go with the ludicrously expensive Xbox Elite Controller. It is beautifully designed and engineered, the paddles and intuitively positioned and the customisation on both hardware and software is staggering. However it is still not worth £120 to the average gamer in my opinion. The ID@Xbox programme has been churning out some strong titles recently and several were showing at EGX. With twenty people waiting for a turn on the single Cuphead machine we were shepherded through to play Jump Stars by Pixel Blimp. Currently a local multiplayer/couch co-op game (although the developer mentioned they are working on online play), it involves picking a cube-like character to participate in several mini games to find an overall winner. First of all, the trolling potential is huge. The games we played involved avoiding dropping hammers or passing a bomb between players, all the time punching or pushing each other in the pursuit of victory. It’s slated for release next year and is definitely on my watch list. After scouting some of the Triple A game queues and finding them not to our liking, we headed into the Indie Megabooth in search of hands on time with new titles. We weren’t disappointed, spending two sessions playing Videoball by Action Button Entertainment. I’d seen this on a Giant Bomb stream a few months ago and was keen to experience it for myself. Videoball combines elements of arcade shooting games and “real life” invasion sports like Football or Rugby. The goal of the game is to shoot the ball into the other team’s goal but gets way more tactical as its E3 trailer shows. We had several games with the developer Tim Rogers who was very approachable and enthused about the game, as well as being seriously good at it. This definitely has that “one more game” feeling. The number of arenas and the different player counts on each team will make this a firm favourite at LANs and online if they can nail the netcode. After som e more Blur, our final game was one we didn’t actually get to play. IO Interactive were demonstrating new features from the upcoming Hitman game, recently pushed back to a 2016 release. One of the developers walked us through part of a mission based in a French mansion. I can say it was easily the most impressive thing I saw all day. Aesthetically and technically the game was stunning. A photo realistic in-engine video showed Agent 47 interacting with some of the 300 possible NPCs involved in the mission, which was based around a fashion show. Every room of this massive house was lovingly crafted and allowed the player complete freedom to explore, plot and murder at will. If this level of detail and visual fidelity is backed up with fresh and varied missions this could be the game to get you through those barren Spring months (provided it doesn’t get pushed again). 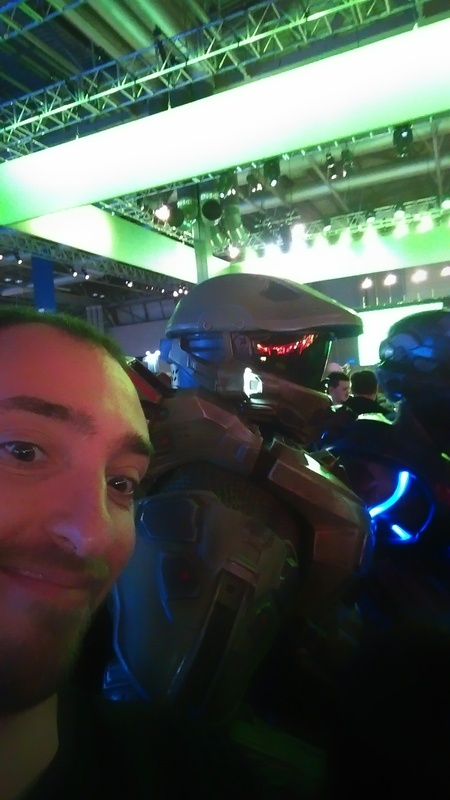 In summary EGX 2015 met all my expectations, with some pretty big queues but with loads to do if you wanted to play more than 2 games in a day. The venue was spot on for hosting an event on this scale and would be an ideal home for the show moving forward.